Your walk-in unit is a focal point to your kitchen. It stores bulk purchases at optimal temperatures and ensures that your ingredients are kept in a consistent environment that promotes the longevity of your purchases. What many don’t realize is that the insulation for your walk-in unit can play a huge role in the efficiency of the unit itself which can impact your utility bills, the maintenance of your unit, and the lifespan of your unit as well. With an R-value of R2-R5 per square inch, it takes about 8 inches of XEPS to equal the R-value of Foamed-in-Place Polyurethane counterparts. Thus, you’ll likely need a larger compressor to accommodate for the decrease in efficiency in an XEPS-insulated walk-in unit. While this unit may be cheaper up front, the increase cost of utilities will likely set you back in the long-run. By pouring insulation between the two metal skins, foamed-in-place polyurethane is made. This option has a high R-value of R8 per square inch, and while it has a lower R-value retention, the end result is still better insulation and R-value properties than XEPS. This option has the best moisture resistance and best fire resistance as well with a melting point of around 700 degrees Fahrenheit. This type uses glued insulation to metal skins, using the same polyurethane as foamed-in-place insulation as the bonding agent. While delamination may occur, this is mostly due to faulty manufacturing processes and is mostly a thing of the past. The wall, floor, and ceiling panels are insulated to maintain the internal temperature of your walk-in, and most manufacturers use foamed-in-place urethane as opposed to laminating the metal on polystyrene. While this is less expensive, it’s also less efficient. While some companies may opt to use XEPS, they typically only do so with their coolers and reserve foamed-in-place polyurethane for freezer walk-ins because of the improved insulating factor. If you have questions about your walk-in or are considering adding one to your setup, give me a call today! 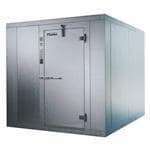 761034-X (QUICK SHIP) Walk-In Cooler or Freezer 9'-8" x 32'-8" x 7'-6"
761020DX (QUICK SHIP) Cooler/Freezer Combination Walk-In 9'-8" x 19'-3" x 7'-6"
760830-X (QUICK SHIP) Walk-In Cooler or Freezer 7'-9" x 28'-10" x 7'-6"
760606-X (QUICK SHIP) Walk-In Cooler or Freezer 5'-10" x 5'-10" x 7'-6"
760834-X (QUICK SHIP) Walk-In Cooler or Freezer 7'-9" x 32'-8" x 7'-6"
761030-X (QUICK SHIP) Walk-In Cooler or Freezer 9'-8" x 28'-10" x 7'-6"